New NBC/WSJ poll shows a decade of pessimism… Obama’s goal for tonight’s 9:00 pm ET State of the Union: convincing the American public to watch and listen… The good news for Obama in the poll: Majorities say big parts of his agenda should be a priority… Chris Christie’s poll collapse… A polling reality check on Snowden… 55% back marijuana legalization… Obama to raise the minimum wage for federal contract workers… On the GOP’s response… Deal on farm bill reached… And Warner (R) endorses Warner (D). The State of the Union address can yield some of the most enduring moments of a presidency. 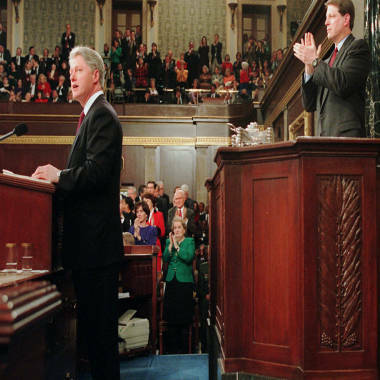 Here's a look back at 50 years of memorable SOTU moments. *** A decade of pessimism: If you're a Washington-based politician, you might want to duck when seeing these numbers from our new NBC/WSJ poll. Or you just hope that Americans tune in when President Obama delivers his State of the Union tonight at 9:00 pm ET to Congress. According to the poll, 63% of the public thinks the country is headed in the wrong direction; 71% aren’t satisfied with the economy; the president’s approval is a weak 43%; and Congress’ is even worse at a mere 13%. When respondents were asked which one or two words best describe the state of the nation, the top answers were all negative: “divided” (37%), “troubled” (23%), and “deteriorating” (21%). Only 3% described the state of the union as “strong.” And in an open-ended question asking the same thing, the top responses were “downhill” and “wrong track.” So when the president addresses the country tonight, he’ll be speaking to a pessimistic nation. But this isn’t a new phenomenon: The last time our NBC/WSJ poll showed that a mere 40% (!!!) thought the country was headed in the right direction was back in 2004 -- 10 years ago. A DECADE!!! There are plenty of possible reasons for this decade of pessimism. The hangover from the Iraq war and 2008 economic collapse. The increased partisanship and polarization in the nation’s capital. A president (who came into office with big expectations) they might not like. A Congress they loathe. And an economy, despite improving indicators, that they think doesn’t work for them. *** Obama’s goal for tonight: convincing the American public to listen: Indeed, the country is ripe for a “Bullworth”-kind of moment in which the president says, “The state of our union is actually stronger than many of you think. But the state of every politician in this room, including myself, needs some serious work -- because what’s happening in Washington is dragging the rest of the country down.” Of course, after covering Obama for the last seven years, he’s unlikely to say something like that; it’s his M.O. to stay upbeat and optimistic and not rock the boat. But the big danger for Obama heading into tonight’s speech is that Americans begin tuning him out like they do most second-term presidents. According to our poll, just a combined 40% say they are either “optimistic and confident” or “satisfied and hopeful” about Obama’s remaining time in office, versus 59% who are either “uncertain and wondering” or “pessimistic and worried.” That’s the president’s goal for tonight: convincing them to listen. *** The good news for Obama: Majorities say big parts of agenda should be priority: But the poll isn’t all bad news for the president. Big parts of the agenda he’s expected to champion in tonight’s speech are exactly what the public wants to hear. Per the survey, 91% say it’s a priority this year for the administration and Congress work together to create jobs; 63% say it’s a priority to ensure all children have access to pre-school education; 59% say it’s a priority to close tax loopholes for corporations; 54% say it’s a priority to fix and keep the health-care law (despite the law remaining unpopular in the poll); and 51% say it’s a priority to raise the minimum wage. But just as House GOP leaders are considering a possible immigration push for later this year, the poll shows that only 39% think immigration should be a priority for this year. It’s one of the few issues we tested where majorities of Democrats, independents, and Republicans all agree that it should NOT be a priority. Go figure. *** Christie’s collapse: Here’s the other big headline from our NBC/WSJ poll: Chris Christie’s poll numbers have collapsed in the wake of the two different scandals that have rocked his administration. And the entire rationale for Christie presidential bid -- his crossover appeal -- appears to be gone. According to the poll, his fav/unfav score is now underwater at 22%-29%. That’s a reversal from back in October, when his rating was a net-positive 33%-17%. Then look inside the numbers: He now has negative numbers among Democrats (15%-37%), independents (20%-27%), and women (21%-27%) when all of those groups were in the positive territory three months ago. And then there’s his number among Republican respondents: a pedestrian 32%-20%, which is down only slightly from October (38%-19%). Folks, no one should be describing Christie as a GOP front-runner or co-front-runner for 2016 anymore. Sure, he has plenty of time to recover. But when someone who was never LOVED by the base loses his CROSSOVER appeal, that’s like holding a pair of 3s in a game of Texas Hold’em. *** A reality check on Snowden: The poll also contains a reality check on Edward Snowden six months into the story about his leaks on NSA surveillance: The public at large seems to be saying, “Meh,” despite the intense conversation in Washington and in the media. Per the poll, just 23% say they support what Snowden did, 37% oppose his actions, and a plurality -- 39% -- say they don’t have an opinion. Folks, that means this story is no longer penetrating the American public. When “no opinion” leads, it means they don’t really care. There’s no doubt that Snowden’s leaks were once a big story, and there’s no doubt that he has sparked a public-policy debate inside Washington (and within the White House). But when nearly 40% of Americans say don’t have an opinion about the guy, you have to wonder if the story continues to have legs six months after his first revelations. *** 55% back marijuana legalization: And here are a final set of numbers from our poll, per NBC’s Mike O’Brien: A majority of Americans -- 55% -- say they support allowing their states to sell legalized and regulated marijuana. To be sure, the public here is divided when it comes to age and political party. “Americans aged 18 to 34, for instance, broadly favor legal marijuana by a whopping 49-point margin. Americans over the age of 65, by contrast, oppose legalizing weed, 59 percent to 38 percent.” And: “Democrats favor pot legalization by a 34-point margin, while Republicans oppose it by 23 points. Among independents, 60 percent favor legalization, while 39 percent oppose it.” Despite those divisions, however, the intensity on the subject comes from the pro-legalization side. *** Obama to raise the minimum wage for federal contract workers: Back to Obama’s State of the Union tonight, this news executive action that Obama plans to announce has already leaked out: “President Barack Obama plans to announce that he will issue an executive order raising the minimum wage for federal contract workers with new contracts to $10.10 an hour,” NBC’s Peter Alexander and Alastair Jamieson report. *** Deal on farm bill reached: Meanwhile, NBC’s Frank Thorp reports that House and Senate negotiators have reached a deal on the farm bill – after months of back-and-forth negotiations. *** Warner (R) endorses Warner (D): And finally per NBC’s Kasie Hunt, former GOP Sen. John Warner endorsed the Democrat who replaced him the Senate, Sen. Mark Warner. It’s a reminder to Ed Gillespie and the GOP trying to unseat Warner in 2014 that he will be a VERY FORMIDABLE opponent. Click here to sign up for First Read emails.